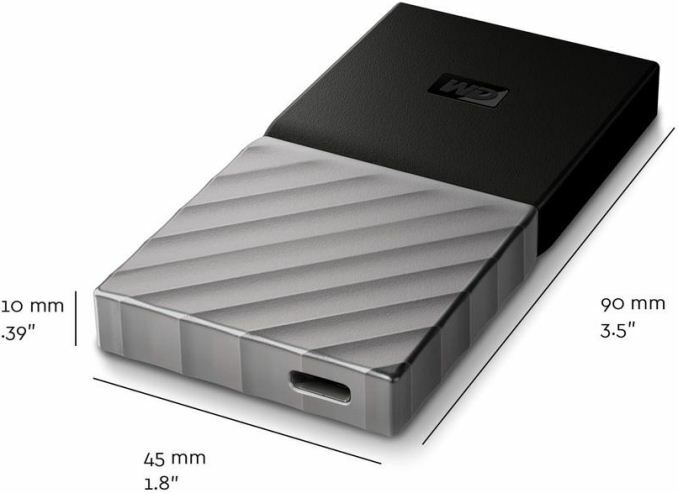 Western Digital has announced its first external SSDs to be sold under the WD brand. The My Passport SSDs are shock resistant, support hardware-based AES-256 encryption, use USB 3.1 Type-C at 10 Gb/s and promise to offer up to 515 MB/s transfer rates. Western Digital does not disclose too many details about its WD My Passport external SSDs, but only says that the family includes models with 256 GB, 512 GB and 1 TB capacities. From the rated performance point of view, the WD My Passport seems to be faster than many other external SSDs that typically come rated for ~450 MB/s read speed, but real-world performance will need to be tested. 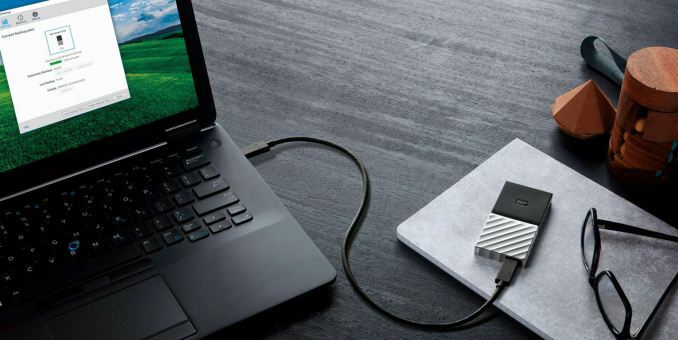 Typically manufacturers use their internal SSDs for their USB-powered drives, so, it is logical to expect Western Digital to use either its current or next generation of its mainstream SATA offerings, with appropriate firmware, for the My Passport products. Given the fact that we do not know which drives are inside the external SSDs, we cannot say whether the My Passport SSD devices use planar or 3D NAND flash, but keep in mind that so far Western Digital has not announced a single 3D NAND-powered consumer SSD. Some good news is that the actual drive inside the My Passport SSD supports hardware AES-256 encryption (which indicates a more or less sophisticated controller) to improve performance for those who care about the security of their external data storage devices. 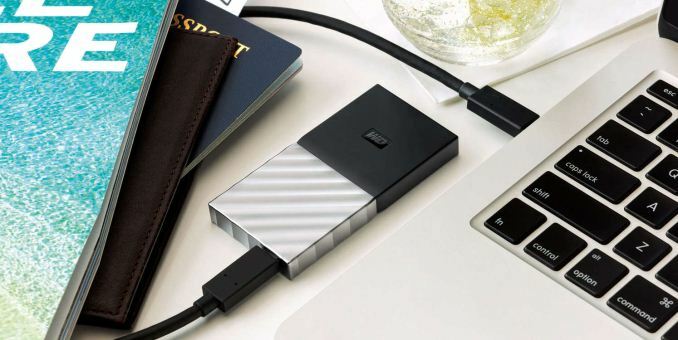 Unlike the WD My Passport hard drives, the My Passport SSD does not resemble an actual passport, but comes in a rugged 90×45×10 mm enclosure made of a gray metal that is tested to survive a 1.98 meters (6.5 feet) drop. The drive is formatted as a single exFAT partition and is compatible with all modern versions of Apple macOS (Mavericks, Yosemite, El Capitan, Sierra) and Microsoft Windows (7, 8, 10). WD’s Backup software only works with Windows, whereas Mac owners can use only WD Security as well as WD Drive Utilities. Unfortunately, the My Passport SSDs do not support Google Android (at least for now). Western Digital is currently offering its My Passport SSDs exclusively in Best Buy stores in the US, with wider global availability expected later this quarter. Each drive comes with a USB Type-C cable rated for 10 Gbps as well as a USB-C to USB-A adapter. As for pricing, WD plans to charge $99.99, $199.99 and $399.99 for the 256 GB, 512 GB and 1 TB models respectively.